Posted on December 1, 2010 by Ronald Patrick Raab, C.S.C. 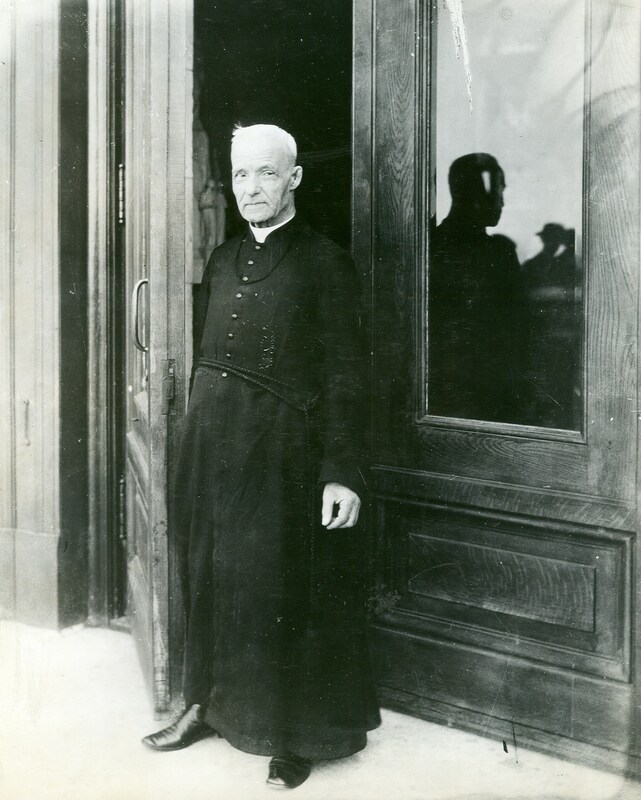 Brother André Bessette didn’t need fancy degrees to know how to welcome the sick who came to the Holy Cross community. Now, he’s the order of educators’ first saint. My path to the priesthood, as with all priests in the United States, involved many years of higher education. I earned two degrees from the University of Notre Dame before being ordained a priest in the Congregation of Holy Cross in 1983. Later I received yet another master’s degree from Notre Dame. I learned all the appropriate professional skills. I studied the correct rubrics from scholars of liturgical history. 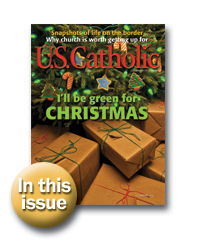 The vision of the Second Vatican Council prepared me for what I thought my work would entail. The education that truly formed me, however, has been learning to pray through my own suffering and the inconsolable pain of others. I am now a student of an uneducated orphan and sickly man, Brother André (Alfred) Bessette, C.S.C., born 30 miles from Montreal in 1845. Ironically, the frail, illiterate brother is our first saint in the Congregation of Holy Cross, a religious order that is best known for our achievements in education. Brother André dedicated his life to St. Joseph and to people suffering from spiritual and physical illness. He convinced the Holy Cross community in Montreal in the early 1900s to build St. Joseph’s Oratory. Today, the oratory houses the many crutches, canes, and wheelchairs left behind by healed pilgrims who prayed to St. Joseph upon Brother André’s request. Because of his ill health, members of Holy Cross did not initially want Brother André as a member of the Congregation. His novice master begged the community to allow him to stay because of his intense prayer. He professed vows and was assigned as porter at Notre Dame College in Montreal, the only formal ministry he held his entire life. He began to welcome the sick and the fragile, the ill and the outcast. His door became his entry into people’s deep suffering and isolation. André’s formally educated confreres quickly became displeased with so many sick people congregating around the schoolyard. Now that I have come to the doors of the Downtown Chapel in Portland, Oregon, I have learned to pray and serve from Brother André’s example. These red steel doors open every day to hundreds of people who cry for help dealing with mental illness or who are consumed with unending loneliness. Our parish staff and volunteers welcome to our daily hospitality center people struggling to get off drugs, the recently unemployed, and those who have spent their entire adult lives living outside. We welcome people who lash out at others because they cannot heal from their own sexual abuse. We welcome people with gangrene and people who have just been released from jail. Every day we are confronted with our insufficient answers to unsolvable problems. I arrived here at the red doors of the Downtown Chapel more than eight years ago disillusioned with many aspects of the church. I arrived here in great need of spiritual healing. I turned to Brother André to welcome me, just as he welcomed others in need of healing and consolation in Montreal. Now I experience what André encountered, the inconsolable pain of people. People living in poverty are now my teachers. Because he could not read, André memorized the Beatitudes and other passages of scripture that offer hope to people in pain. He believed that faith alone was the answer to real human suffering. Confronted with hundreds of people each day waiting to speak with him, André often lost his patience. He was often rude and curt with people who did not want to pray. His curmudgeonly style did not deter people from wanting to be physically touched and emotionally affirmed by God. I lose my patience as well when I realize in recent years the church has moved away from its healing mission, relinquishing many hospitals, nursing homes, and orphanages. The personal touch of healing has been replaced by large corporations and impersonal technology. At our parish doors, I realize that faith alone can motivate people to give of themselves when other people hurt in so many ways. Brother André died on January 6, 1937. More than a million pilgrims streamed to Montreal for his funeral. In those days before jet planes, the Internet, and cell phones, the real communication of faith and gratitude spread rapidly among believers. The Catholic Church canonized Brother André Bessette in Rome on Sunday, October 17, 2010. On that day, I unlocked our red doors in Portland and praised God for André’s example. Posted on December 1, 2008 by Ronald Patrick Raab, C.S.C. Bonnie signed up for our hospitality center on her first morning in search of new clothing and a warm breakfast. Her boundless energy disturbed everyone’s routine in the small basement room. Suddenly our entire staff, volunteers, and the room full of guests awakened to her forceful presence. We panicked as she stuffed food into her pockets, paperback novels under her jacket, and rolls of toilet paper in her plastic bag. Bonnie’s kleptomania unnerved the staff, her penetrating voice disturbed many of our shy guests, and her wiry presence evoked fear in me. Bonnie began her Advent journey by disturbing our entire operation. She prayed during Mass on her first day with a voice that could stop a train, screaming out every liturgical response at the right time but with a dozen extra words. She threw off the rhythm of our common prayer so completely that the entire congregation stopped speaking. People erupted with complaints and tried to quiet her. Bonnie persisted with her prayer. Many of us were left confused and bewildered in those first few days with Bonnie. She stirred up resentment among our neighbors, angered many parishioners, and even blocked people from entering our front door. But I also began to notice something shift inside me. Slowly I opened my eyes to see her differently. I began to hear the message of Jesus in Mark’s gospel: “Be watchful! Be alert!” Bonnie shook me out of my own sleepiness toward people who suffer beyond my imagining. I started to interpret her disturbing actions and screeching voice as our Advent wake-up call, a real prophet in our midst. She challenged our professional ideals regarding how we deal with crisis and how we try to keep order as we serve the poor. As the voice crying out in the desert, she echoed the words of Isaiah and John the Baptist to get our acts together and let go of our control. Bonnie was not going to let us get too comfortable thinking we were in charge of our lives or even of the parish. Once we all began to see her as a gift to us, she started to change our experience both of her and of the Advent season. One day during Mass I heard Bonnie screaming outside the chapel. She was trying to stop people from stealing her things. When Bonnie started screaming, I saw one of our parishioners leap out of the pew to go outside. There was something about her scream that day that was raw and primal. I felt deep sadness rise up in me. Bonnie was communicating to us that many things in our society are not right. Her haunting scream reminded me of all the ancient prophets who tried to get the attention of people to reform their lives and society. I heard in her scream the challenge to wake up and realize that addicts need shelter and sobriety, people need adequate housing, and the mentally ill need affordable medications. I felt in her scream the poverty of the world. Bonnie also changed my perceptions of her loud responses at Mass. In the very predictable patterns of common prayer, I understood by her piercing voice that those who are marginalized by poverty or mental illness need to be heard. Mass could no longer be prayed on autopilot. We had to think about what, how, and why we were praying the liturgy. She made us think about our responses to the Word that was proclaimed. She halted us in the middle of blindly reciting the Creed. Like the biblical prophets before her, she was teaching us how to pray and live with new awareness and intention. Bonnie still reminds me that most of the suffering around us remains hidden and secret. She helps me realize we all must take on the prophet’s role when disease, poverty, loneliness, and financial instability grab hold of our communities. People who suffer silently need the voices of the rest of us to speak up for the abandoned and neglected. The Advent season calls for courage and conviction to make faith real, inviting, truthful. Advent is a time to go deeper into our human condition, beyond the surface of relating to one another from our financial status or educational backgrounds or the styles of clothing we wear. I thank God for our prophet Bonnie. Even though she washed her glazed donuts in our baptismal font, collected our hymnals in her shopping cart, and took hundreds of our plastic rosaries to wear around her neck, we all recognized that she carried Christ into our midst. She unstuck my notion that Advent is about the purple polyester fabric in the sanctuary or the flattened, artificial greens with faded, purple ribbons posing as the circle of life. She helped me break open the lie that Christmas is for the rich and well-deserving. God desires to be in relationship with all of God’s beloved. Before Bonnie left our parish, she knelt down in front of the crèche on Christmas Eve. Several parishioners feared her kleptomania as she approached the newborn king. Instead, poised in prayer, she placed a clean, meticulously folded purple blanket in the small stable. It was her cleanest blanket, her source of warmth on the cold Portland streets. I never realized I would find the birth of Jesus in the center of mental illness, homelessness, and my own insecurity. God gave us the gift of hope years ago in a small stable and continues to grace us with real human beings who teach us that faith is about relationship. I wait patiently for Advent this year to see if our prophetic sister returns. I wait for love again to awaken me.